TE is on… Super Smash TV! Now it’s a bit odd, but I decided that I m posting an article here when it was intended to be a guest article for another site. Weird, no? Well that’s the way it’s going to be, and you’re going to have to deal with it. I ran out of time, and it’s the only backup I had left. Sure this contains very little of the brilliance of my regular articles, but it shall be something to read nonetheless. The pictures are as well low-budget, as I don’t want to take the time to take screenshots if I’m not even doing this seriously, so I just stole them from a Google image search. This review is obviously (as long as you took the time to read the link and the title) about the game Super Smash TV. It’s a game that I really enjoy, and was playing a lot for a while back in October. 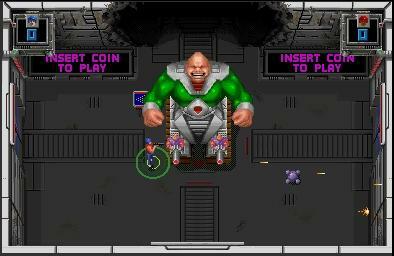 The game is very simplistic, as it is derived from an arcade game of a similar name. While the arcade version might have a few extra scenes and (slightly) better looking models (I think, I only glanced at one screenshot. In the console version, they look like ugly men. ), there probably isn’t a whole lot of difference between the two. 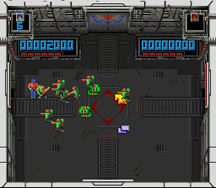 The game is basically you and possibly a friend running around a maze, killing hordes of enemies and picking up a bunch of prizes along the way. 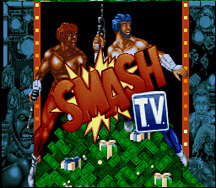 It’s set up as some sort of futuristic game show, and I think it’s pretty accurate, as with the current trend of violence-loving and reality TV, a real life Smash TV might not be far off. But that sad, sad fact aside, the game is pretty fun. It’s also pretty hard, and I can’t get too far without cheating. There are tons of enemies, way more than in any Gauntlet game, even. And the bosses have tons of life and really enjoy killing you. Even though it’s almost always the same thing over and over, I find that the game doesn’t get too boring after playing it a lot. The only real different rooms are the cash rooms and bosses. The only annoying part of the game is at the end of a level, when your points are tallied up. It’s fine if you do badly, but if you get a lot of stuff, it can take a long time to add up all your points. And the worst part is that you can’t skip it, you have to sit for 1 to 3 minutes waiting for the points to count up. Now like I said, you basically just go around shooting stuff. Enemies constantly flood out of each side of the room, and you just can’t stop them. Fortunately, there are a whole bunch of power-ups to help take the gaggles of goons out. A bunch of weapons are at your disposal, like machine guns, rocket launchers, and spread shots. Then there are other things like the speed-up, invincibility, and a shield. The only thing is that the rooms last a long time, and the power-up don’t last nearly long enough to be of maximum use. But they do appear quite often, so it sort of balances out. The bosses, on the other hand, are incredibly hard to beat if you’re not cheating. They’re pretty big, have a lot of weapons, and are slightly faster than yourself. Not only that, but they take forever to kill, and most of the time, your forced to use special weapons because normal guns don’t work at all. So not only are they very hard to not get killed by, but they take forever to beat, too. If there is an upside, it’s that the third one (I think) looks just like the announcer guy, and I thought that was pretty funny. Now that I’m done with the summary, here’s my point tally. I enjoy the game, but not in extended periods of time. I might beat a few rooms one day, save state, play a few rooms the next day, and so on. The lack of notable/memorable music is a real downer for me, but that just means I can turn off the sound and pop in one of my CDs without feeling cheated out of awesome music. It’s games like this that are the foundation of what an arcade should be. 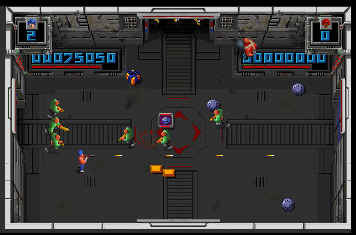 We need less of those damned shooting and fighting games and more of the old-school adventureish games like this or that Ninja Turtles arcade game. Overall, I’ll give it a 7. So that’s about it. I do feel a little low for posting this on my site, it’s not exactly up to my general standards. But what can I say, it took me about an hour to write, including the time it took me to figure out what I’d write about, get the pictures, and write the thing. So I guess the last little note I should tack on here is that if you’ve got a friends nearby and a couple of PC gamepads, go download this ROM now, or buy one of the many classic arcade compilations that have this game on it. It’s a game worth trying out, and as I’ve said for many a game before this, it’s great for killing time.